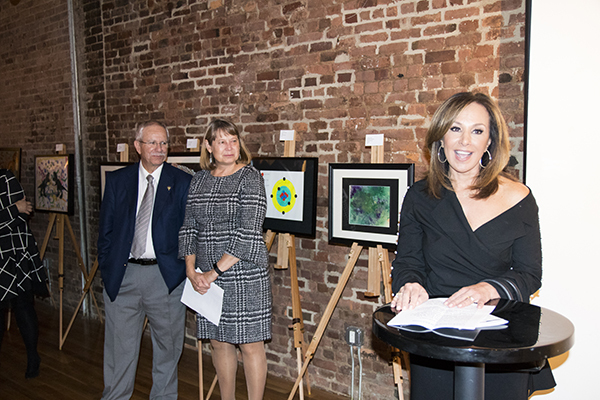 Roseanna Scotto joined HeartShare artists at the ArtShare Opening Reception at Clover’s Fine Art Gallery on Thursday, November 9. (left to right) Bill Guarinello (HeartShare President and CEO), Linda Tempel (Executive Director, Developmental Disabilities Services) and Rosanna Scotto (Co-Host of WNYW’s Good Day New York and HeartShare Board Member). HeartShare artists–children and adults–came together for the ArtShare Opening Reception at Clover’s Fine Art Gallery on Thursday, November 9th. The show featured over 115 artworks and photos, as well as handcrafted jewelry from over 70 individual artists and artisans who participate in HeartShare’s programs. The ArtShare program continues to serve as an expressive platform in a world that often chooses not to see or hear them. With the end of NASA’s Saturn mission and the sighting of the total solar eclipse, artists produced paintings of the Cosmos, including Rings of Saturn, Particles in Space, Cosmic Dust, Helix Nebula and Eye of God. Other pieces offered social commentary on political life, including Stripes, America and The White House. Cityscapes and the natural world were common themes. 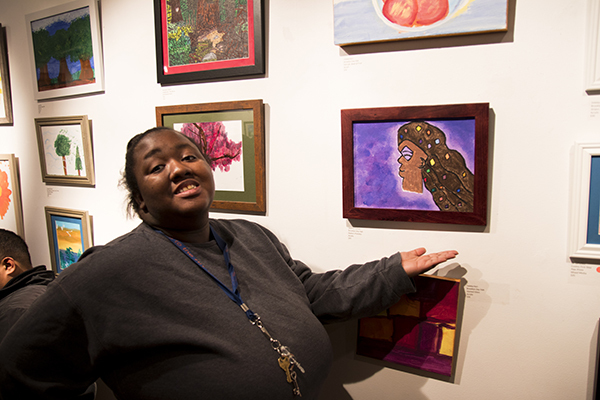 ArtShare is a program for children and adults with intellectual and developmental disabilities. Under the guidance of HeartShare staff serving as artists-in-residence, artists create multimedia works, including paintings, photos and collages. The program also has cultivated a jewelry studio. The production of these works year-round culminate in annual exhibition in the fall. Throughout the years, HeartShare has cultivated partnerships in the community, contributing to the expansion of artists’ reach and inclusion. In addition to the Opening Reception, NYU Tandon School of Engineering, National Grid and 12 MetroTech (Forest City Ratner) host ArtShare lobby shows. HeartShare also has cultivated educational opportunities with The Museum of Modern Art, The Museum of National History, The New York Transit Museum and The Dedalus Foundation, affording artists more inclusive participation in the broader New York arts world. Rachel Cohen, an educator from The Museum of Modern Art, has been working closely with HeartShare artists for over a year, including trips to the museum and customized arts education classes on-site at HeartShare Day Habilitation Programs in Brooklyn. The exhibition is open until November 18th and pieces are available to purchase year-round. If you are interested in buying any ArtShare works that you’ve seen online, at our Opening Reception or in the community, please e-mail our Co-Curator at Edgardo.Velez@heartshare.org.